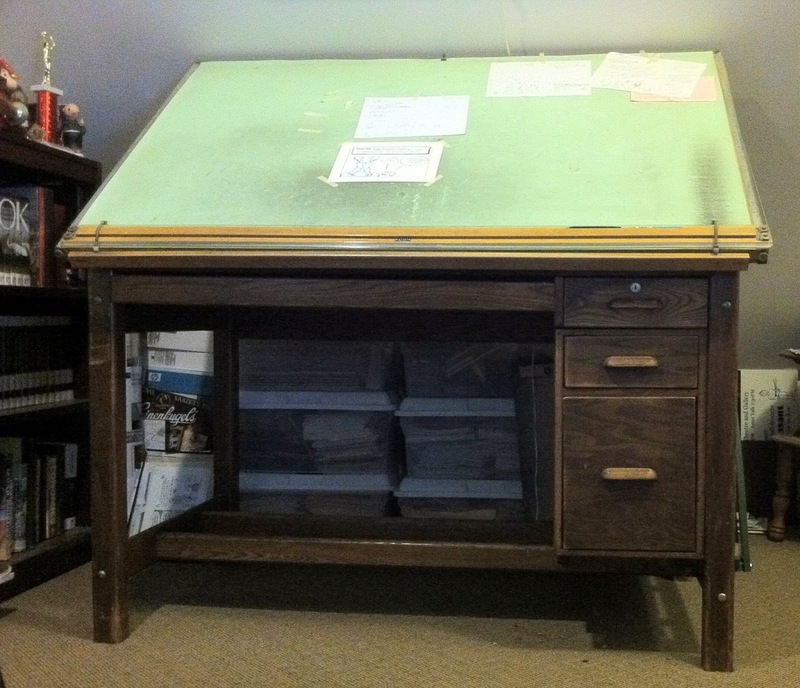 "The drawing table I use (and have used for nearly 30 years) was originally a drafting table from AC Spark Plug," John wrote in an email. "Joe Peltier was/is a friend of mine from Holy Redeemer and Powers days. His father (Hamilton) was an engineer at AC. When they purged the old wooden drafting tables in favor of the modern steel ones, Ham took one home and put it in his basement. I saw it at some point (and coveted it), and my father eventually made a deal with Ham to get it for me as a college graduation gift. (I think a bottle or two of booze was the barter.) It's pretty sweet." Oh lawdy! I have one of these. I just put it back together a few days ago. It's missing the straightedge and lower cabinet, but is otherwise in great shape. Makes a great layout table. I remember those drawing board in Plant Engineering and Industrial Engineering at Chevrolet Flint Manufacturing. I don't remember desks underneath. They started using the small screen monochrome monitors, no bigger than ten inches in diagonal, around 1980. The engineers hated them, and I don't blame them. Over the next few years, color monitors which were much larger, 17 inches or more, became prevalent. CAD CAM programs became much better, and actually improved things for engineers who had engineering minds but geek like motor coordination skills that made drawing hard for them. You had the same resistance in artists who didn't regard computer aided Art as Art. There is still something comforting about doing things the old fashioned way, and for now the boards help promote this. 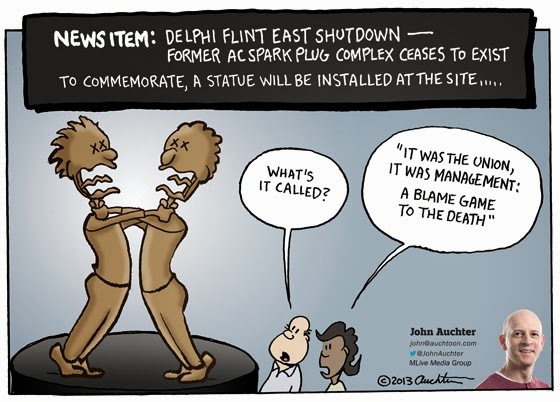 In regard to the editorial cartoon: What people buy determines which factories stay open. No one was to blame. A lot of good paying jobs were lost. We vote with our money in a far greater fashion than our political ballot. It was neither union or management that closed these factories. It is determined by the products that sell. People chose cheap products working out of tax free zones operating in the United States. They chose cheap products made my foreign labor that work for pennies per hour. Is it surprising the same countries buy our land out from under our feet while we buy their trinkets and baubles?